Moths need just the essence of a flower's scent to identify it, according to new research from The University of Arizona in Tucson. Although a flower's odor can be composed of hundreds of chemicals, a moth uses just a handful to recognize the flower. It's like identifying a piece of music from hearing only the notes played by a few key instruments, said lead researcher Jeffrey A. Riffell. "The moth isn't paying attention to all the chemicals at the same time," Riffell said. "It's actually just paying attention to a few." The finding provides insight into how the brain processes a specific smell from the sea of odors floating through the air. The UA team recorded from the brains of tobacco hornworm moths as they smelled each individual chemical of the 60-some that comprise the fragrance emitted by the moth's preferred source of nectar, sacred datura flowers. It is the first time researchers have recorded an insect's brain activity as the animal smelled all the individual chemicals captured from a real flower. Previous research used only synthetic odors. Just nine of the chemicals provoked a neural response. However, all nine had to be presented simultaneously for the moth to fly to the smell's source and then stick out its tongue seeking nectar. Riffell, Hong Lei and John G. Hildebrand of the UA's Arizona Research Laboratories Division of Neurobiology and Thomas A. Christensen of UA's department of speech, language and hearing sciences published their article, "Characterizing and Coding of Behaviorally Significant Odor Mixtures," in the current issue of the journal Current Biology. The National Institutes of Health and the National Science Foundation funded the research. How the brain-olfactory system decodes odor stimuli is not well understood. "Two-thirds of the male moth's brain is geared toward the environment," Riffell said. "For female moths, it's about 90 percent." Tobacco hornworm moths, known to scientists as Manduca sexta, are hawkmoths native to the Southwest. Their favorite nectar source is the sacred datura plant, known to scientists as Datura wrightii. Its white trumpet-shaped flowers bloom only at night. Female moths also lay their eggs on the plant, so to keep things simple, the team used only male moths for the study. 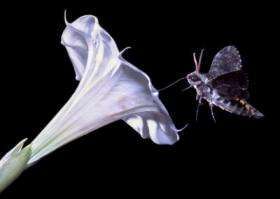 To find food, the moths must recognize the faintest whiff of datura smell and then track the scent upwind to the flower. Riffell figured out how to capture the chemicals emitted by the flower and take them back to the lab. He engulfed a flower with a Reynolds® Oven Bag and sucked the air out of the bag into a charcoal filter to snag all the odor chemicals. He snagged scent from 20 different plants. Back in the lab, he created a solution of the chemicals and injected it into a gas chromatograph. The chromatograph separated the chemicals and spewed them out one by one into a branched tube: one branch led to a wired-up moth and the other to a machine that identified and recorded the individual chemicals as they wafted by. The set-up allowed the researchers to record the moths' brain activity as the animals smelled the individual chemicals. The recording equipment was hooked up to a speaker. If the moth's brain reacted, the researcher heard a rapid pop-pop-pop-pop sound, Riffell said. "Then you look and see what chemical is coming through at that time," he said. The moths' brains "popped" to only nine chemicals from sacred datura's bouquet. To see how moths behaved toward those chemicals, he put synthetic versions of them on an artificial flower made of white filter paper. Then he tested 420 moths by putting a paper flower at one end of a wind tunnel and a moth at the other. The moths were indifferent to the chemicals if they were presented one at a time. In contrast, if a real sacred datura flower was used, the moths flew right to it and stuck out their tongues. When all nine chemicals that had made the moths' brains "pop" were put on the paper flower, the moths behaved the same way. "It was amazing -- as soon as you combined the chemicals, the moth behaved like gangbusters," Riffell said. "It flew upwind to the flower and stuck out its proboscis at the flower." He suspects that human noses and brains also work by homing in on just a few distinctive chemicals in any particular smell. "For an important odor, I think that's what we're doing -- for instance, when we smell coffee."